That universal truth is a core part of Adrift, the soon-to-be-released game that his small team of former big-studio developers have been building for the last couple of years. It’s just not what Orth expects will draw people to play. 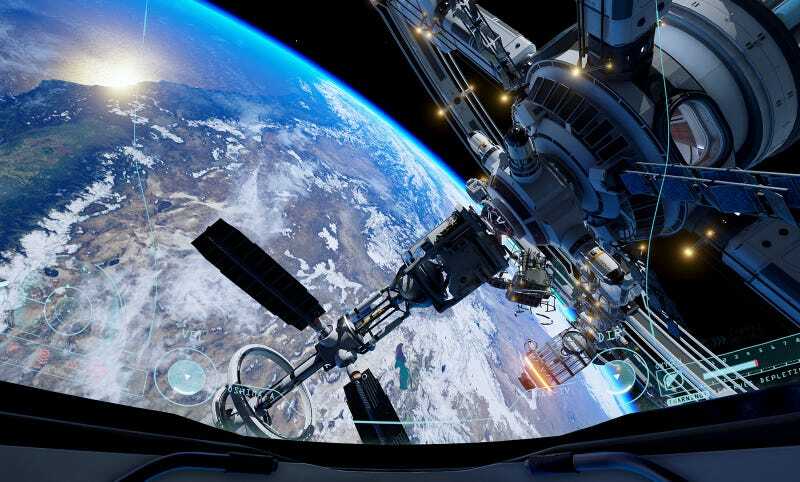 He imagines people will be drawn to the fact that Adrift–technically called Adr1ft to emphasize its focus on solitude–is a first-person game set in space amid a wrecked space station high above the Earth. He thinks they might be intrigued by the fact that you can play the whole game, if you choose, in virtual reality. But the game isn’t simply about floating through the fictional Northstar IV space station, grabbing canisters of oxygen, rebooting computers, tracking down the bodies of former astronaut colleagues and trying to figure out how the hell to get home. It is not, he said, a power fantasy. It’s also not quite autobiography, though there is a lot of him in the game. Adrift was born from personal trials, from what Orth refers to as “the Twitter incident.” That was a traumatic sequence in Orth’s life in which some ill-advised Tweets snarking about always-online consoles in the spring of 2013 led to him temporarily becoming the most hated person on the gaming Internet. It led him to being scapegoated by an online mob and losing his job at Microsoft, after which he got into indie game development with some ex-EA buddies. It also led him, most surprisingly, through a life-improving, family-bonding, attitude-adjusting personal and professional rebirth that he says made him a better person. Adrift springs from all of that. We don’t usually know the inspirations for the video games we play. You can enjoy Pikmin without knowing its lead creator was fixated on gardening. You can enjoy the difficult, quasi-multiplayer Demon’s Souls without knowing its producer was inspired by the helpfulness of strangers when his car was stuck on a snowy mountainside. Knowing what inspired a game can make it more enjoyable and interesting, though. I find it impossible to play Adrift or to even think of it without thinking of the events that forged it. Knowing the real back-story to a game can elevate the ordinary to the fascinating and, in Adrift’s case, freight it with extra meaning. You play this game in first-person and see it through the helmet of surviving astronaut Alex Oshima. Note the initials. You begin immediately after disaster has struck. Your space station is splintered, your colleagues presumably dead. Your oxygen supply is low, and you will likely die soon, too. The game doesn’t waste time explaining who is to blame. Survival is priority. Getting home, if possible, is priority. What’s done is done, and there’s no sense dwelling on it. Orth and many of his colleagues at his small studio Three One Zero have made noisier games. They worked on Medal of Honor games at EA LA for some time. They’ve now made something much quieter. There’s no shooting. Any violence is in the past. Debris floats all around, as do oxygen canisters which you need to drift toward and grab to stay alive. You move freely in zero-gravity, rotating and gliding in any direction. As you move, you hear Oshima’s breathing, which quickens when her air supply diminishes. You use the oxygen to breathe but also to propel yourself, sometimes within wrecked parts of the space station. In the game’s more exhilarating moments, you move outside and untethered in the vacuum, gliding from one damaged section to another with the Earth looming beyond. “I tried to imagine what it would be like in that situation, how chaotic and crazy it would be,” Orth said. In addition to floating and breathing, you spend a good chunk of the game reading, listening and learning, piecing together information about who Oshima’s crewmates were. You float through crew quarters and find computer terminals that contain e-mails and voice recordings. You learn about your colleagues’ hopes and doubts and fears and joys. Orth says there are pieces of him throughout the game, so you can wonder what part of him is the father regretting missing his daughter’s piano recital, or what inspired the passages about members of the team working too hard, or what to make of a young astronaut’s recorded enthusiasm for making her first spacewalk. In conversation these days, Orth frequently mentions spending more time with his own daughter, and needing to make sure he heads into the office lest he spend more of his work days goofing off and just hanging out with her. He said he still feels changed from the difficulties of a couple of years ago, still feels like his priorities are in better order, though he admits, too, that “I did slip into the madness of creation for a good part of development.” He was driven, he said, and excited to be working with friends, to be creatively liberated as independent developers and to call their own shots. In my few hours with the game, much of the most interesting material I found was optional. Some of Adrift’s most gripping lore and extraordinary sights were pocketed near satellites and debris at the most extreme edge of the volume of space you can explore without asphyxiating. As you drift and learn, day turns to night and the brilliance of Earth by day transitions into the even more extraordinary experience of seeing, thousands of miles below, entire darkened continents illuminated by city lights. Adrift is a slow-paced game, and having played a third or so of it I’m sure that some will simply find it dull. You move with less alacrity than you do in most games, and, aside from grabbing oxygen canisters and activating computers to patch up parts of the space station, there doesn’t appear to be much to do. If you’re uninterested in unpacking a story or not moved by its mood and setting, you might be bored. Your suit can be upgraded. You can move a bit faster, breather a bit more air. I didn’t finish the game, so I don’t know how much that energizes the action. But I was hooked by what I played of Adrift, partly by the game’ss extended metaphor but more by the novelty of its location and the way it cultivates a quiet determination to survive. It feels more like the movie The Martian than like its more obvious cinematic counterpart, Gravity. It’s more a meditation on the quiet will to live than a thrill-ride of last-second daredevil maneuvers. The space station itself is a celebration of harder science than we usually find in video games. We don’t float through space fantasy or pass by advanced robots and alien carcasses. We float through a hallway, a computer hub, a long tube filled with plants and floating water bubbles that emerged from a damaged water supply. Adrift also functions as a technical showpiece for the potential of virtual reality. Originally slated for a September release, Orth’s team delayed it so that it could launch alongside the Oculus Rift, the $600 virtual goggles that might finally make VR a viable mainstream product. (Or might not.) Adrift can be be played on a regular screen or it can be played with a Rift. The controls change slightly in VR mode, giving players the ability to re-center their view with the tap of a button. Played on a TV, Adrift is crisp and clean and looks expensively made. The game lost some visual fidelity when I played it in the Rift but it gained an impressive sense of scale and depth, especially when I had Oshima float outside the space station and look down at Earth. Adrift is coming out at the end of the month for PC and console, at which time we and other critics will be able to take Orth’s extended metaphor in its entirety. On the eve of its release, the game certainly remains interesting and distinct, an already-declared victory for people who root for game designers to take risks. A full playthrough will certainly reveal more. For now, though, Orth seems proud and also quite pleased with the personal journey he’s taken.